David Icke is a prominent researcher, author, and speaker who has been revealing aspects of the occult, the secret government, extraterrestrials, and corruption in society through his work. Like many figures of this kind, the ignorant masses often assume that the only motivation is monetary—that Icke does what he does for the money. People who have never known the sweetness of passion and the joy of inspiration that comes from working towards a worthy cause, think it is inconceivable to imagine people doing things for non-monetary reasons. In other words, some people are so traumatized and mind controlled by the monetary system, they assume people only do things for fame and fortune. Thus, people like David Icke must only be doing what they do for wealth. Well, the truth isn't so reductionist. 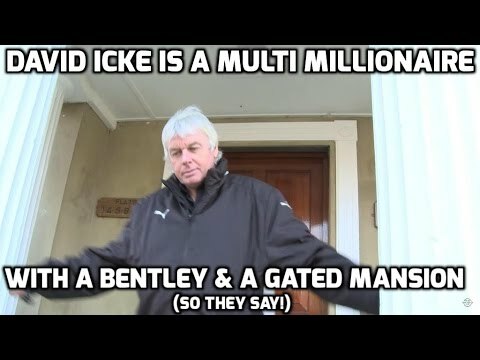 Icke released a video to dispel the claims of some who assert that he lives in a lavish house and maintains an opulent lifestyle because he makes so much money from his work. He isn't the only person in the field of alternative media disclosing truths about this world who has been accused of defrauding patrons. David Wilcock, Corey Goode, and countless others have also been charged with "making up stories" so they can bilk people out of their money. But if they are guilty of these things, they have a lot to learn because they aren't rich. To be sure, there are scam artists out there who are motivated to do almost anything they can to procure some money, but there are also people who have found that inner spark of life's passion. I think part of the reason why detractors can't accept that someone does the work for non-monetary reasons is because that person's life motivations are primarily extrinsic instead of intrinsic. The reality is when you finally find your life purpose and feed energy into that so as to develop the skills to carry it out—nothing else matters. When you've found your passion and what you do is filled with inspiration, all of your beingness is profoundly stimulated and satisfied simply by doing what you love to do. Such a person needs no external motivation. But to one who hasn't found their passion, external motivations along with the need to survive in general are the biggest incentives. Yet there is a big difference between just surviving and truly loving life. Normally, without the intercession of our would-be masters through the trappings of culture, a child uses their optimum learning state of presence in the moment to realize their personality potentials, becoming an inspired, intelligent and capable human being, filled with happiness and a love of life. As a matter of fact, the majority of self-made, accomplished people in art, sports, and spirituality, are self-motivated—they do what they do for the love of doing it—not for monetary gain. 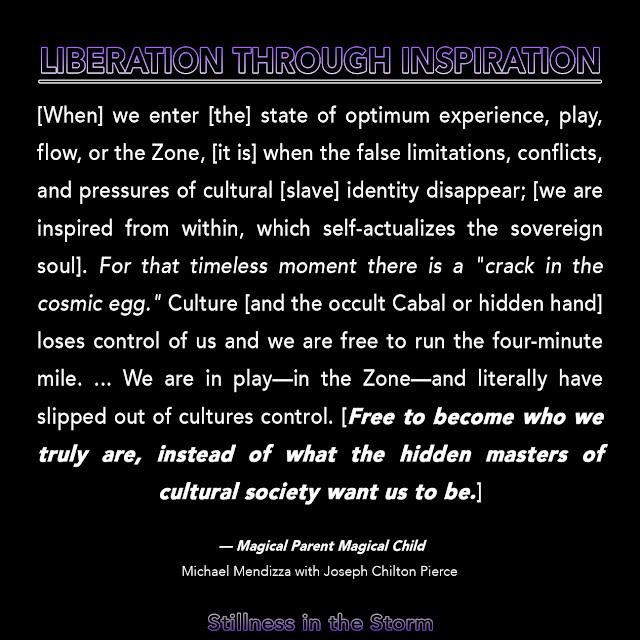 Joseph Chilton Pearce, Michael Mendizza, and Alfie Kohn are three researchers and authors who have written many books on the topics of child psychology, human development, and the difference between behavioral modification techniques (extrinsic) and optimum learning states (intrinsic). Generally speaking, there are two motivational methods, intrinsic and extrinsic. Extrinsic motivational techniques use rewards and punishments—a carrot on a stick or a whip at the back—to impose, coerce or entice someone to do something they otherwise wouldn't do. Intrinsic motivation comes from within, whereby the act of doing the thing is its own reward. Intrinsic motivations tend to be intangible or metaphysical, like passion, love, and inspiration. Extrinsic motivations tend to be tangible to some degree, like money—but not always. We could have an extensive discussion about the difference between the two, as there are many side effects to consider. But in short, extrinsic motivation kills one's lust for life, making them shallow, insecure and often unhappy over time. Conversely, intrinsic motivate does the reverse in all respects, it tends to make people deep thinkers, confident, and fulfilled. Intrinsically motivated people do the things they do because of their love for them, often able to spend hours upon hours to realize their goals. On the other hand, extrinsically motivated people spend just enough energy to get the job done—often taking short cuts and covering up mistakes if they can get away with it. Watch this short video reviewing a study on the difference between intrinsic and extrinsic motivation. And here is the video Icke released, debunking the notion that he has gained incredible wealthy by defrauding people. In conclusion, Icke is clearly an intrinsically motivated person. He said he has dedicated his life to the work, which in examining his labor, is all about spreading the truth so as to make this world a better place. While intrinsic motivations can be either altruistic or self-serving, the benefits of life purpose are the same. Inspiration is an over-unity way of being. Energy to do what we love seems to fill the cup of our consciousness to spilling over, which is the way of inspiration. To those who contend Icke and others only do what they do for money, the truth is most altruistic people are not wealthy. But the dichotomy is that without money, the work wouldn't be possible. On our world, the mind virus of money has infected almost everyone in society. This means we all need money to some degree just to survive, let alone to do the work of making the world a better place. But for many, money is an end unto itself. Greed, selfishness, and lack of empathy lead to immoral and unethical behaviors, as people clamor to gain more money to fill the void within themselves. One day, hopefully soon, the status quo will change but only if we do the inner work to change ourselves. But for now, we can't ignore the realities of money. Yet when we do that inner work to know thyself and feed time and energy into discovering our passions in life, money ceases to be the only motivation. For those who have done this work, doing the thing they love is more than enough reward. And when everyone on Earth has found their passion, we will transition into an age where intrinsic motivation overshadows extrinsic motivation. Today, fear, social pressure, and pandemic suffering motivate most to work in society, amongst the trappings of egoism and materialism. But the currency of tomorrow will be passion, love, and inspiration, filling up the hearts and minds of all people, making the need for money seem decidedly primitive. Whether or not we realize this utopia vision of the future is up to us here and now. Our choices matter and how we motivate ourselves to live life make a world of difference. This article (Dispelling Rumors and Inspiration is its Own Reward | David Icke Is A Multi Millionaire With A Bentley & A Gated Mansion) originally appeared on StillnessintheStorm.com and is free and open source. 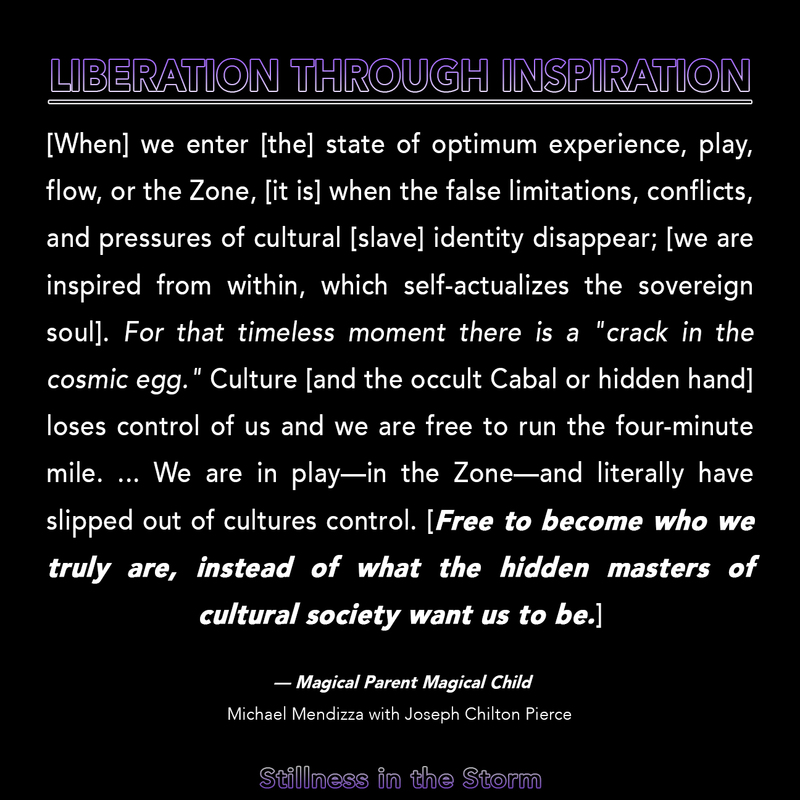 You have permission to share or republish this article in full so long as attribution to the author and stillnessinthestorm.com are provided. If you spot a typo, email sitsshow@gmail.com.